Precision mapping: The organization and location of brain networks in the cerebellum differ among people. In the new work, researchers analyzed scans of 10 brains they obtained through the Midnight Scan Club — so called because the brains were scanned after midnight, when the fees to use the machines are cheaper. The club’s staff used a technique called ‘precision mapping,’ in which they scan each person’s brain for 30 minutes while the person rests. They did this on 10 consecutive nights. The resulting images show the extent to which activity in parts of the cerebellum tracks with that in other brain regions in each person. Based on these correlations, the researchers assigned regions of the cerebellum to various neural networks, including the dorsal attention network, the default mode (daydreaming) network and those that control the hands, face and feet. They also assessed the relative size and position of these networks in each person. The brain scans reveal both similarities and differences among people. The size of the networks in the cerebellum varies twice as much as that in the cerebral cortex — a variable researchers should account for in their studies. The frontoparietal network, which is involved in high-level thought processes, takes up a greater proportion (23 percent) of the cerebellum than of the cerebral cortex (10 percent). The finding hints at the cerebellum’s role in high-level cognition, the researchers say. The team also analyzed the scans for the relative timing of brain activity. They found that signals in cerebellar networks lag behind those in the cerebral cortex by 125 to 380 milliseconds. This finding suggests that the cerebellum processes signals originating in the cerebral cortex, such as those involved in learning. The results appeared in November in Neuron. ‘Precision mapping’ could be used to understand how individual differences in cerebellar organization contribute to differences in behavior. 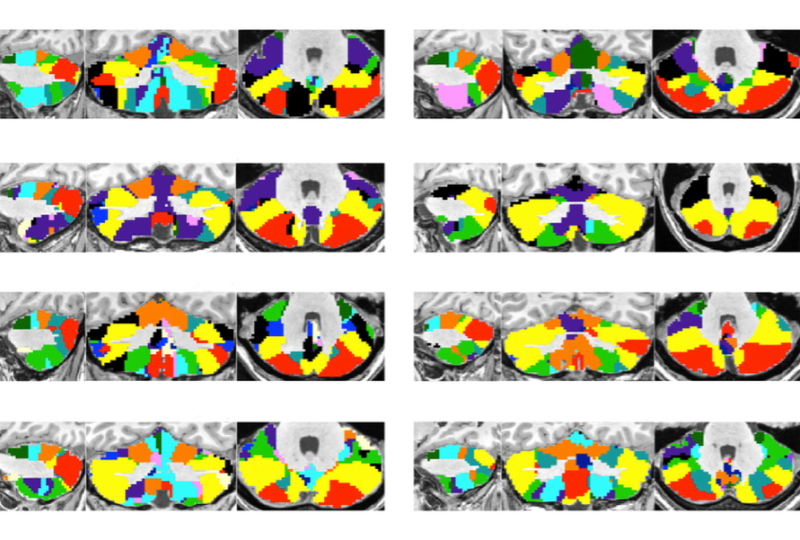 The Midnight Scan Club dataset is freely available at OpenNeuro.